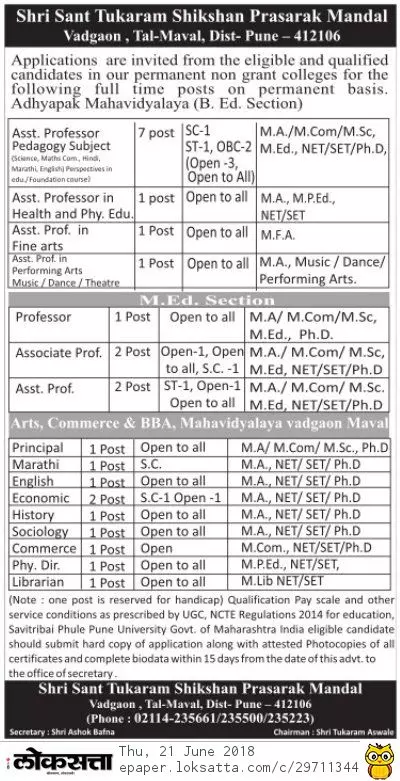 Shri Sant Tukaram Shikshan Prasarak Mandal, Pune has advertised in the LOKSATTA newspaper for recruitment of Teaching Faculty- Professor / Associate Professor / Assistant Professor / Principal / Librarian / Physical Director jobs vacancies. Interested and eligible job aspirants are requested to apply within 15 days from 21st June 2018. Check out further more details below. How to Apply: Interested and eligible candidates are requested to send CV with attested photocopies of certificates / testimonials and recent PP size photos to the postal address mentioned below.